During the last years I have participated at many different events and thereby I gained several impressions, of which parts such an accompanying programme can consist – which formats work well and which don’t. Now I am very glad to share my experience and to contribute to this project while at the same time being, to be honest, a bit nervous about how the programme will be received. The best structure, the most interesting content and the best qualified experts will mean nothing at all when no one is attending. This would be a worst-case scenario that we definitely want to avoid. So, to catch your interest, I will gladly give you further information about the programme and the process of planning. Representatives of different organizations and departments such as Geoverbund ABC/J, HPSC TerrSys, ISMC and Forschungszentrum Jülich (Human Resources) will be present at information stands. This is the main part of the programme that gives all participants the chance to directly get in contact with us, to ask all the questions you in mind and to receive first-hand information. 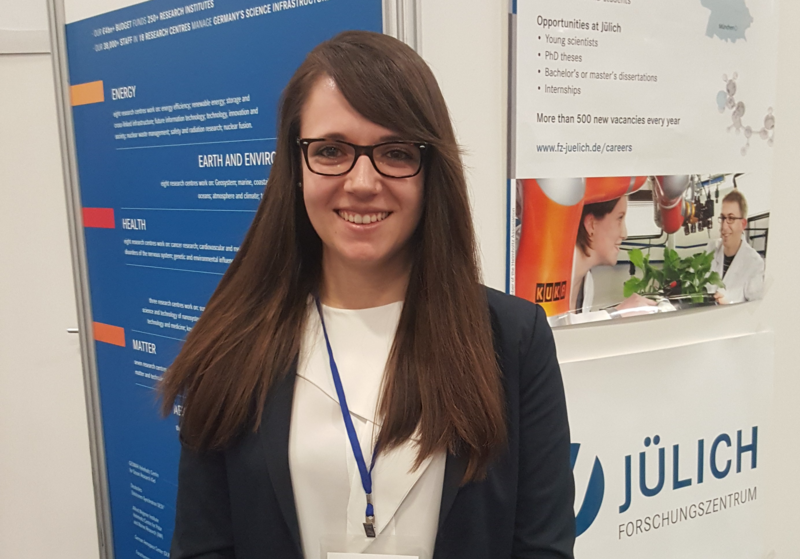 While most of my colleagues will focus on providing information about their current research, facilities and cooperation, I will be glad to show you, what Forschungszentrum Jülich as an employer offers for young and experienced scientists and how you can become part of our team. Besides the part of the accompanying programme I have mentioned above, I have so many other ideas in mind! One of these is a series of presentations on topics such as the German research landscape, Geoverbund ABC/J and the Jülich Soil Research or Forschungszentrum Jülich as one of Europe’s largest research institutions / as an Employer. In addition to that I can imagine a far more interactive format with discussions on round tables between participants and experts from Germany, focusing for example on topics like pathways to a PhD or career opportunities for postdocs in Germany. Furthermore I would really like to give information about or even to organize a training session on how to apply for scientific positions in Germany. Another Idea I think of – that from my point of view would be great – is an evening event that fosters the communication between scientists from Africa and our representatives from Germany. I am sure, that sharing ideas, experiences and expectations with regard to your research and your current employers would be very interesting and enriching for both sides. The next difficult step will be to identify which of these ideas fit to the interest of the attendees we will meet in Ghana in November, to plan and structure the accompanying programme in detail. That is why for me it would be very interesting, in which parts of the programme you would be interested most or if you have any further ideas. In this sense I look forward to your comments!